One-piece frame is made of rust-proof fiberglass-reinforced nylon polymer. Steel handle and noseplate. Built-in stair glides. IN STOCK. Includes (2) 10" pneumatic wheels. 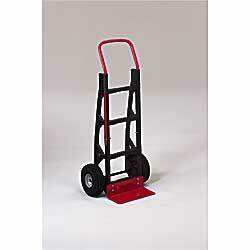 Includes (2) 5" swivel poly casters and (2) 10" pneumatic wheels. YA-2497 25	 21x51"	 500	 15x7"
YA-2498 28	 36x12"	 22-1/2"W x 41-3/452-1/2"H.	 600	 600	 15x7"	 4850-1/4"